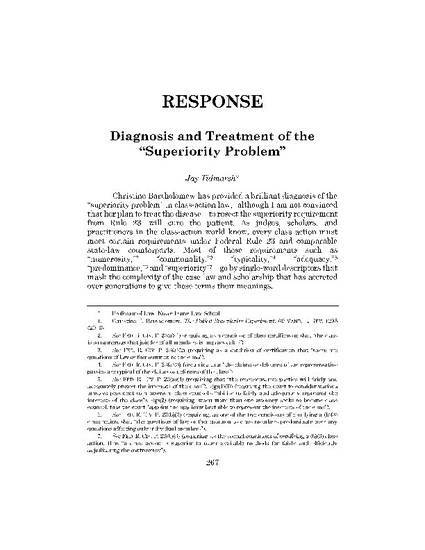 Christine Bartholomew has provided a brilliant diagnosis of the "superiority problem" in class-action law, although I am not convinced that her plan to treat the will cure the patient. If superiority is to be eliminated, predominance must also be abandoned. Some new formula must replace Rule 23(b)(3) in its entirety. The problem of Rule 23(b)(3) is that the factors (especially superiority) give too much power to courts to get the results they want. Unless the ills that Professor Bartholomew documents are to be repeated in a new form, any replacement for Rule 23(b)(3) must be far more specific and concrete in its terms than the present Rule. Moreover, its terms must be crafted with an eye to the rest of Rule 23, in particular the interlinked fairness and efficiency requirements of Rule 23(a) and the provisions in Rule 23(b)(1) and -(b)(2). Professor Bartholomew's proposal may not bring us to the promised land, but her article shows us why the effort to craft a better Rule 23 is both necessary and worthwhile.